It is believed that a Richard Ioyes, of Galway, Ireland, created the Claddagh around the end of the seventeenth century, upon his return from a rather eventful trip, intended for the West Indies. Before getting very far along in the voyage, Algerian pirates captured and sold him as a slave to a Moorish goldsmith. Luckily for us, Richard's master taught him the art of metalworking. He put it to wonderful use creating a ring rich with matrimonial symbolism. The heart stands for love, the hands for friendship and the crown for fidelity. A Claddagh may be given as a token of friendship, received as a wedding ring, or worn just because you like it. The engraving on our Claddagh Rings is the same style as our Large Claddagh Pendant #230-L.
A symbol of constant, faithful love, our heart-in-hands Claddagh Pendants are perfect tokens of affection. Arms reach around in an eternal circle to hold a crowned heart. 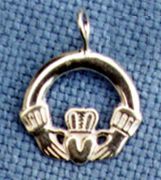 Size Small is cast flat with a ring at the top and measures 1/2" long by 7/16" wide . Size Large has a perpendicularly attached ring for dangling. Large measures 1 1/16" long by 3/4" wide.